Fellow Necole Durham with a student. 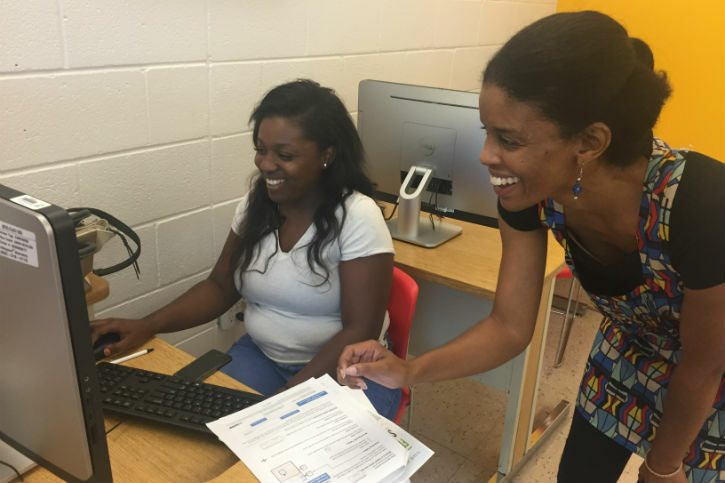 Last year, NTEN launched the third cohort of our Digital Inclusion Fellowship. While the program model was the same we’d used previously, this cohort came with an exciting difference: the majority of the host organizations were churches serving African American communities. While we hadn’t worked directly with churches previously, African American churches made sense as a program partner for a multitude of reasons. For one, African Americans consistently have the lowest rates of internet use among surveyed groups in the US. When it comes to having access to high-speed internet, only 57 percent of African Americans have a broadband connection at home compared with 72 percent of white Americans. As the community centers and resource bases for one of the most digitally marginalized communities in the US, churches are uniquely positioned to provide digital literacy training and resources to their constituents. During the Fellowship year, our third cohort achieved some outstanding feats. They trained nearly 2,000 individuals and provided almost 9,000 training hours to communities in need of digital skills. They offered classes in languages including English, Spanish, and Arabic, on topics ranging from computer basics to creating online greeting cards and building resumes. Fellows worked primarily with churches, but also partnered with community centers, housing authorities, and public schools. They collaborated with local ministries already working with underserved communities, and helped identify and meet the needs of the individuals they were serving. One of our Digital Inclusion Fellows worked with the Housing Authority in Austin, Texas, while the remainder of the Fellows were hosted by churches, and worked with a pre-determined cluster of partner churches in the Bay Area and Atlanta. Here are a few of the lessons that were learned and reaffirmed by the NTEN team, our Fellows, and partners. 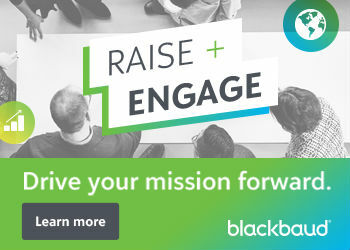 How do you make sure that the folks doing this work will follow through on their commitments? What gives you confidence that the work will be sustainable? Having clear buy-in from your organization and its partners is a critical piece of the puzzle. Talking about buy-in and commitment is easy enough, but making sure that it gets put into practice is more challenging. One way to address this is to have conversations with a wide variety of staff before launching the program, from the coordinators and trainers themselves to the leadership of the organization. Those conversations should actively involve them in the planning, so that they feel personally invested in the outcome. Setting clear goals from the beginning and ensuring alignment will also help everyone row in the same direction once implementations starts. Communicating those goals clearly and transparently both within your organization and to partners will help everyone keep their commitments, as well as giving an easy out to those who realize it’s not a good fit (it’s better to realize this in the planning stage than during implementation). Lastly, communicating what your plans are to the community keeps you and your partners accountable. 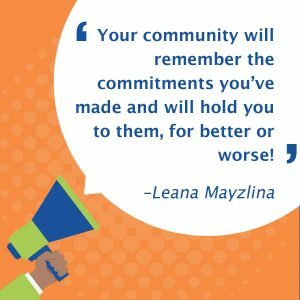 Your community will remember the commitments you’ve made and will hold you to them, for better or worse! In drafting project plans, we supported the Fellows in aiming high and dreaming big. We set goals for everything from how many individuals they’d train to how many lab hours they’d provide. Several months into the program, challenges started to bubble up. How do you provide lab hours in a church that doesn’t have a computer lab? How do you provide trainings to individuals on weekends when the facilities are closed? This is an area where the Fellows again proved themselves to be dedicated, committed, and creative. When there wasn’t an obvious and simple path forward, they came up with innovative ideas. In places with no computers, Fellows would set up an ad hoc mobile lab, bringing laptops to the training site. Others developed BYOD (Bring Your Own Device) classes to help students learn to navigate their phones or other devices. Where facilities were closed during peak class hours, Fellows partnered with libraries, schools, and community centers to offer classes. Others met learners where they were instead of asking them to come to a central location. While the solutions were diverse, what stayed consistent across the cohort was the commitment to innovate and find solutions. Collaboration is critical not just for finding creative solutions, but also for extending the effects of your work. When community needs are great and there are not nearly enough services, it’s important that local organizations don’t waste time and energy reinventing the wheel. Share your time, knowledge, and resources with local partners to make a bigger impact. Our Fellows made this look easy even when there were hurdles in the way. One of our Atlanta Fellows provided training at a veterans’ organization, while another partnered with the Urban League and a Senior Center. The partnerships varied in scope and approach. While some Fellows trained trainers at other organizations, other Fellows shared curricula, or applied for joint funding. Not only did this expand the reach of the programs, but it also helped bring in new communities, from immigrants to veterans and seniors. But let’s be honest: collaboration and partnership is not always the panacea we make it out to be. It’s all too easy to keep racking up the partners until suddenly you realize that there are too many cooks in the kitchen. Instead of that collaboration being the steam engine that pushes your program forward, progress can be derailed. An important lesson around partnerships is to be clear and upfront about roles, responsibilities, and goals. Not only does that help set expectations from the beginning, but it also gives you the opportunity to step away from the partnership if there’s no clear role for the partner or goals they align with. Through the challenges of working with a multitude of partners, we stepped away with a great lesson in how to determine which partnerships work and how to make them successful. Read the full report from Cohort 3 here. With all of the learnings from Cohort 3, as well as our previous Cohorts, we made modifications and updates to the program and launched a fourth Cohort with a slightly different program model. You can read about the updates here and connect with our Fellows in the Digital Inclusion community group.